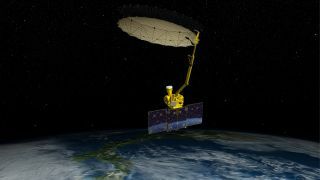 This artist's depiction shows NASA's Soil Moisture Active Passive satellite with its giant mesh antenna fully deployed in space. A recently launched NASA satellite has just deployed a giant antenna in space. The huge tool will help scientists collect unprecedented data that could help craft better weather forecasts around the world. The space agency's Soil Moisture Active Passive spacecraft (SMAP) is tasked with beaming back new global soil moisture maps designed to aid in crafting more effective warning systems for floods, droughts and other possible emergencies. SMAP mission controllers deployed the 20-foot (6 meter) mesh reflector antenna fully on Feb. 24, less than one month after the satellite launched from California in late January. You can also check out a video showing SMAP's antenna deployment as an artist's illustration. The giant mesh antenna isn't quite ready for prime time yet. Mission managers still need to spin up the tool so that it can begin gathering data about the top 2 inches (5 centimeters) of topsoil around the globe. The antenna should start spinning up to 15 revolutions per minute in the next month, when it will be able to begin collecting data. "Deploying large, low-mass structures in space is never easy and is one of the larger engineering challenges NASA missions can confront in development," Kent Kellogg, SMAP project manager at NASA's Jet Propulsion Laboratory, said in a statement. "This week's result culminates more than six years of challenging reflector and boom assembly development, system engineering and an extensive test campaign." When SMAP is fully functional, it will be able to produce a global map of topsoil moisture every two to three days, NASA officials have said, and the mission is currently scheduled to last for three years. Scientists want to use these maps as a way to create better weather forecasts and understand if certain areas are at risk for droughts and floods. NASA officials also hope the data will help countries around the world predict crop harvests and even raise a warning about possible famines. The SMAP mission is one of five Earth-gazing missions launched to space in the past 12 months by NASA. Another of those missions — called the Global Precipitation Measurement mission — recently produced an amazing video of global precipitation. "The highly accurate measurements from these new missions will help scientists around the world tackle some of the biggest questions about how our planet is changing," Luce said in a statement. "These new capabilities will also be put to work to help improve lives here on Earth and support informed decision making by citizens and communities."